Watch smiles bloom when you~re spotted in the lovely Pomelo Floral Midi Dress! 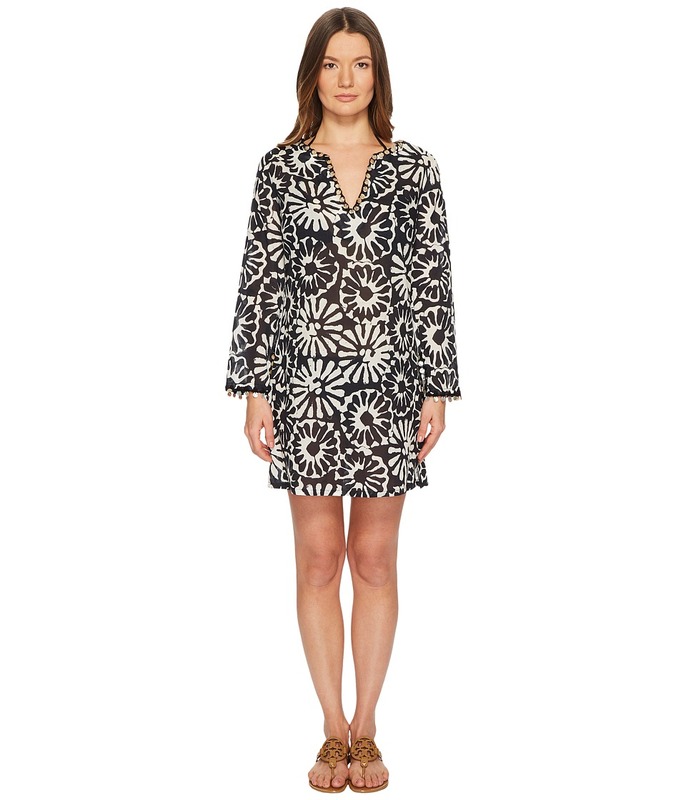 Lightweight cover-up features African daisies in a block-style print. Deep V-neckline at surplice bodice. Half sleeves. Elastic empire waist with adjustable drawstring. Vented straight hem. Slip-on design. Bikini not included. 100 percent viscose. Hand wash, line dry. Imported. Measurements: Length: 48 in Product measurements were taken using size SM (Women~s 4-6). Please note that measurements may vary by size. 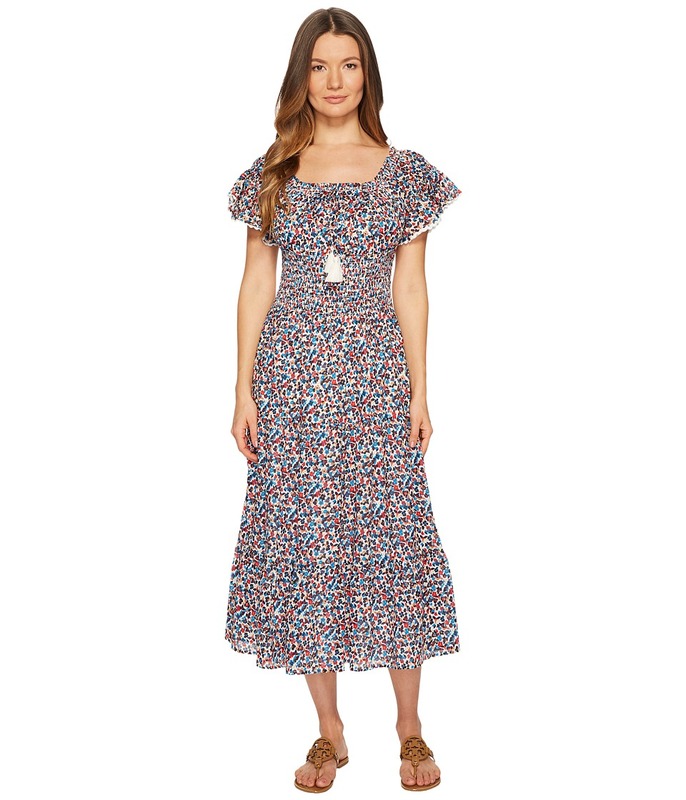 Enjoy the sunshine and the sights in the breezy Wildflower Smocked Dress. Lightweight cover-up in a feminine floral print. Scoop neckline. Tasseled drawstring accents the smocked torso. Flutter cap sleeves. Slightly flared skirt. Straight hemline. Slip-on design. Bikini not included. 100 percent cotton. Hand wash, line dry. Imported. Measurements: Length: 46 in Product measurements were taken using size SM (Women~s 4-6). Please note that measurements may vary by size. Live that luxe waterside life in this captivating cover-up. Lightweight cover-up in a prismatic print. 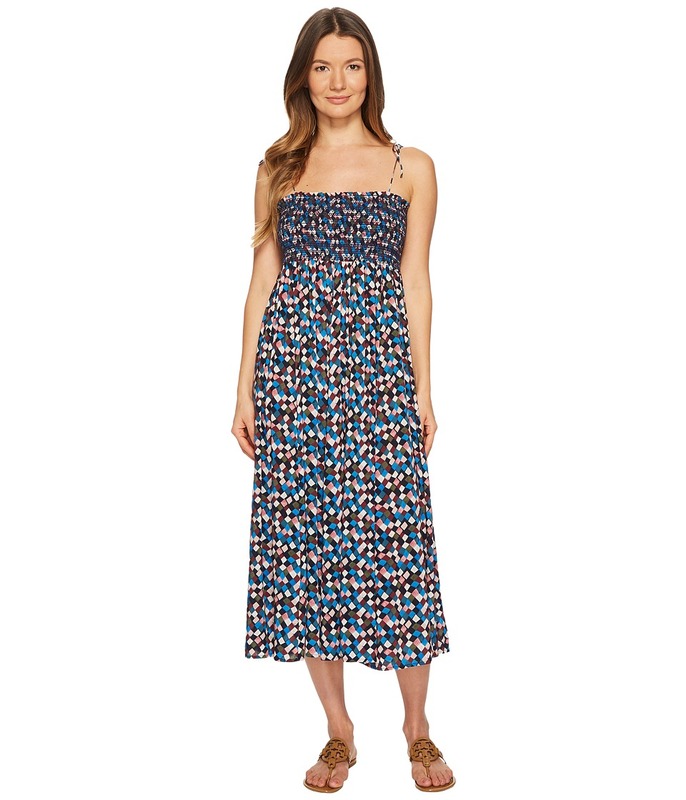 Convertible design can be worn as a dress or long skirt. Straight neckline with smocked bodice. Self-tie shoulder straps. Straight hemline. Slip-on design. Bikini not included. 100 percent viscose. Hand wash, line dry. Imported. Measurements: Length: 40 in Product measurements were taken using size SM (Women~s 4-6). Please note that measurements may vary by size. Sophistication and sand go hand in hand with this sensational swimwear! Contrast stitching accents the solid bandeau top. Eurojersey Sensitive fabric: &amp#8226 Four-way stretch with excellent shape retention. &amp#8226 Fabrics~ fine, open structure reduces dry time. &amp#8226 Fade resistant to preserve color. &amp#8226 SPF 50 fabrication blocks harmful UVA/UVB rays. Ruffle trim at straight neckline and under bust. Free of cups and padding. Slip-on design. Bikini bottom not included. Body Lining: 72 percent nylon, 28 percent Lycra elastane. Contrast: 71 percent nylon, 29 percent Lycra elastane. Hand wash, line dry. Imported. If you~re not fully satisfied with your purchase, you are welcome to return any unworn and unwashed items with tags intact and original packaging included. Consider a suntan lotion subscription because you~re going to want to spend plenty of time in this chic swimwear! Bikini top in a solid hue for an easy-to-pair, cute-to-wear look. Eurojersey Sensitive fabric: &amp#8226 Four-way stretch with excellent shape retention. &amp#8226 Fabrics~ fine, open structure reduces dry time. &amp#8226 Fade resistant to preserve color. &amp#8226 SPF 50 fabrication blocks harmful UVA/UVB rays. Ruffle trim highlights the deep V-neckline and adjustable shoulder straps. Removable contour pads provide support and shape. Self-tie closure at middle back. Bikini bottom not included. 71 percent nylon, 29 percent Lycra elastane. Lining: 72 percent nylon, 28 percent Lycra elastane. Hand wash, line dry. Imported. If you~re not fully satisfied with your purchase, you are welcome to return any unworn and unwashed items with tags intact and original packaging included. Live that luxe waterside life in this captivating bikini top. Sliding triangle top in a prismatic print. Eurojersey Sensitive fabric: &amp#8226 Four-way stretch with excellent shape retention. &amp#8226 Fabrics~ fine, open structure reduces dry time. &amp#8226 Fade resistant to preserve color. &amp#8226 SPF 50 fabrication blocks harmful UVA/UVB rays. Deep V-neckline. Free of cups and padding. Adjustable straps tie on shoulders. Tie closure at middle back. Bikini bottom not included. 71 percent nylon, 29 percent Lycra elastane. Lining: 72 percent nylon, 28 percent Lycra elastane. Hand wash, line dry. Imported. If you~re not fully satisfied with your purchase, you are welcome to return any unworn and unwashed items with tags intact and original packaging included. Watch smiles bloom when you~re spotted in the lovely Pomelo Floral Beach Tunic! 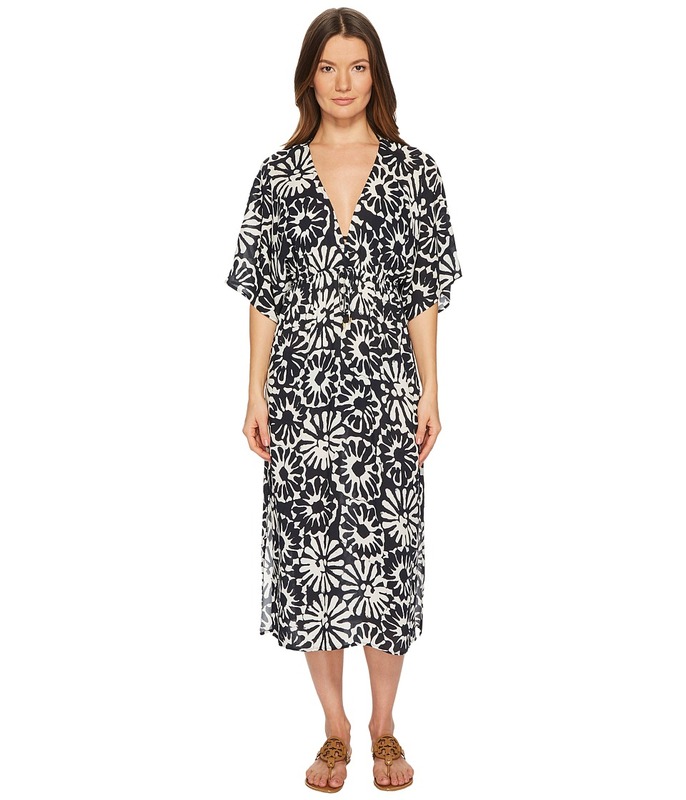 Lightweight cover-up features crochet trim and African daisies in a block-style print. Seashells accent the split scoop neck. Long sleeves boast mother-of-pearl beads at the cuffs. Vented straight hem. Slip-on design. Bikini not included. 100 percent cotton. Hand wash, line dry. Imported. Measurements: Length: 33 in Product measurements were taken using size SM (Women~s 4-6). Please note that measurements may vary by size. Sophistication and sand go hand in hand with this sensational swimwear! Contrast stitching accents the solid bikini bottom. Eurojersey Sensitive fabric: &amp#8226 Four-way stretch with excellent shape retention. &amp#8226 Fabrics~ fine, open structure reduces dry time. &amp#8226 Fade resistant to preserve color. &amp#8226 SPF 50 fabrication blocks harmful UVA/UVB rays. Smocked, ruffle-trimmed waistband hugs the body. Moderate rear coverage. Bikini top not included. Body Lining: 72 percent nylon, 28 percent Lycra elastane. Contrast: 71 percent nylon, 29 percent Lycra elastane. Hand wash, line dry. Imported. If you~re not fully satisfied with your purchase, you are welcome to return any unworn and unwashed items with tags intact and original packaging included. Transform the pool deck into your personal runway with the chic Solid Low Rise Hipster Bottom! Solid bikini bottom can easily pair with a range of printed or solid tops. Eurojersey Sensitive fabric: &amp#8226 Four-way stretch with excellent shape retention. &amp#8226 Fabrics~ fine, open structure reduces dry time. &amp#8226 Fade resistant to preserve color. &amp#8226 SPF 50 fabrication blocks harmful UVA/UVB rays. Low-rise stretch waist conforms to the body. Moderate rear coverage. Bikini top not included. Body Lining: 72 percent nylon, 28 percent Lycra spandex. Hand wash, line dry. Imported. If you~re not fully satisfied with your purchase, you are welcome to return any unworn and unwashed items with tags intact and original packaging included.